The U.S. Mint will open sales for the 2017 America the Beautiful Quarters Circulating Coin Set (product code 17AC) starting on November 21 at noon Eastern Time (ET). 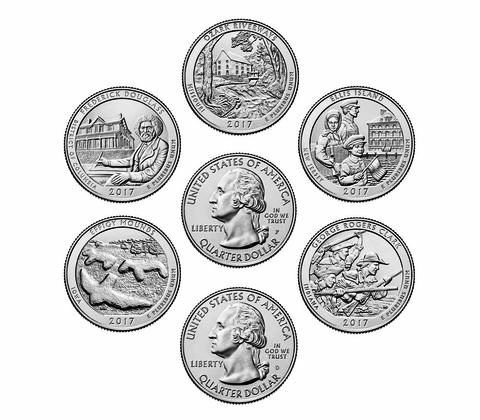 This year’s set includes 10 circulating quarters — five from the Philadelphia Mint and five from the Denver Mint — with reverse designs honoring Effigy Mounds National Monument (Iowa), Frederick Douglass National Historic Site (Washington, DC), Ozark National Scenic Riverways (Missouri), Ellis Island (New Jersey), and George Rogers Clark National Historical Park (Indiana). The coins are held in a durable plastic card that features a picturesque image and a brief description of each site and coin. The packaging allows the coins to be easily removed and placed in albums or other collecting media. A Certificate of Authenticity is printed on the back of the card. 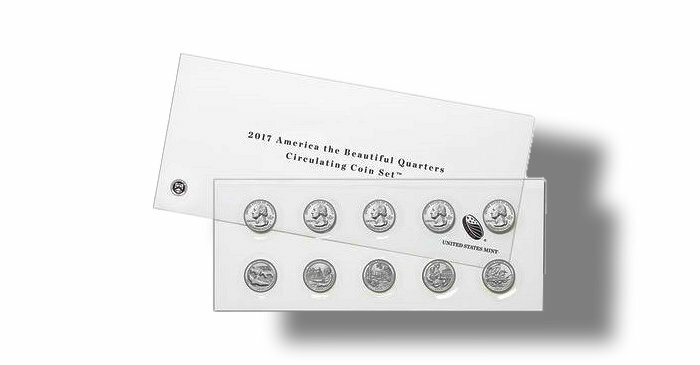 The 2017 America the Beautiful Quarters Uncirculated Coin Set is priced at $5.95. The Mint will accept orders via its online catalog and at 1-800-USA-MINT (872-6468). Hearing- and speech-impaired customers with TTY equipment may order at 1-888-321-MINT. Information about shipping options is available here.